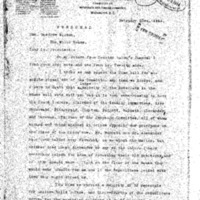 William C. Adamson writes to Woodrow Wilson regarding the voting over the Panal Canal tolls. On my return from Senator Bacon’s funeral I find your kind note and one from Mr. Tumulty also. I think we can report the Sims bill for absolute repeal out of the Committee any time we desire, and I have no doubt that a large majority of the democrats in the House will vote with us, but it is very embarrassing to have the House leaders, chairmen of the leading committees, like Underwood, Fitzgerald, Clayton, Padgett, Burnett, Alexander, and Doremus, Chairman of the Campaign Committee, all of whom worked and voted against it before opposing our programme on the floor of the House now. Mr. Burnett and Mr. Alexander have both talked very favorably to me about the matter, but neither does Judge Alexander or any of the others I have mentioned relish the idea of reversing their old positions, and if they should make a fight on the floor of the House they would make trouble for us and if the Republicans joined with them they might defeat us. You know we carried a majority of 32 democrats for uniform tolls before, and three–fourths of the republicans voting for the exemption defeated it by 25 majority. These gentlemen I have named would lie down in case of an emergency, but they have talked right plainly to me about what ought to be done. Some of them have not hesitated to tell me that you are not so insistent on this because you have not come down and read a message. Now the reason you have assigned to Judge Sims for not reading that message fails to convince me as effectively as your utterances usually do because you have already said enough to members and to newspapers to constitute that message if properly phrased and suppress all democratic opposition to your programme. You are such a master of the English language that you can say all that is neecessary to say without commanding exposing any prejudice secrets or concealing the meaning of any material thing that actuates you. You will make it much easier for your friends who raeeally want to oblige you while committed to the other side if you will come down here and read that message. Others of them say, and many of them who are willing to reverse their position in deference to your judgment on the international situation, that the Senate deals with diplomatic matters and if it is necessary for that reason to reverse their position they think the Senate ought to act first. Therefore I have suggested to Senator Smith of Georgia that he relabel and introduce the Sims bill in the Senate and pass it and send it over here at once. The only trouble about that is if the Senate takes the talking disease to which it is so liable it may be several months before it comes over. Coming down and reading your message would facilitate and expedite the progress in the Senate. Some of these gentlemen habve suggested that they would be bound by caucus action if the caucus would meet and act, but I am averse to that if we can possible avoid it. Some of our staunchest and best supporters are republicans. Our committee has never been partisan. The republican members of the committee respect you and many of them wish to carry out your desires. Therefore I am compelled to insist that you prepare a message and come down and deliver it and the our task will be easy. You know I fought this fight through once and lost it. I am ready to fight it through again, but I have relied on your getting squarly behind me and unless you give me the same actual support that you have given the other measures we will not be so well equipped for the fight. Adamson, William C., 1854-1929, “William C. Adamson to Woodrow Wilson,” 1914 February 23, WWP18373, First Year Wilson Papers, Woodrow Wilson Presidential Library & Museum, Staunton, Virginia.